The features Apple has promised in iPhone 4.0 tackle much of what we're looking for in the next version of the company's mobile operating system. But there are still some features that—at this early stage, at least—are missing in action. Earlier this week, we told you about the top seven features we want to see in the next version of the iPhone OS. Now that the iPhone OS 4 event is over, how did Apple do? Here’s a quick scorecard. Of course, it's important to keep in mind that the progress we've noted below is based on a single overview of iPhone OS 4, months before it’s ready to go—Apple may end up adding to these features, as well as adding many other features, by the time iPhone OS 4 is released. Pervasive multitasking We wanted a way to let apps function in the background; heck, we said we’d be happy with a way for apps to better save their state or a way to more quickly switch between, say, the most recent two apps. We’ve also hoped for audio apps to be able to stream content in the background. 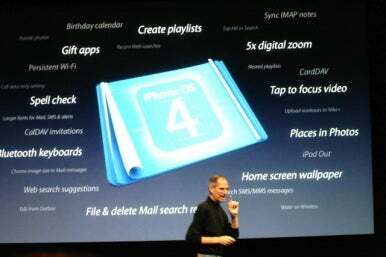 Based on today’s preview, iPhone OS 4 will give us all of those features and more. You’ll be able to keep multiple apps running and then switch between them using a new “app-switching dock.” Audio apps will be able to play in the background, and they can even utilize the iPhone’s pop-up playback controls (the ones you see now if you double-press the Home button while the iPod app is playing). iPhone OS 4 will also provide developers with better APIs for saving an app’s state so the app doesn’t use any resources when not active, but it can be immediately up and running when you switch back to it. And apps that need to finish a lengthy task, such as uploading photos to the Web, will be able to finish those tasks in the background and then gracefully exit. But there’s a lot more: Apps such as Skype will be able to watch for, and notify you of, incoming calls even if you’re working in another app or the phone is locked and asleep. Apps that use your location will be able to use the iPhone’s Location Services API even when the app is in the background, so, for example, a GPS app can continue to provide voice directions while your kids watch a movie in the back seat. Alternatively, if an app doesn’t require pinpoint location accuracy, the developer can instead use a new energy-saving background service that uses mobile-phone towers to determine your location. Finally, another new multitasking feature, Local Notifications, allows applications to notify you of events without needing to contact Apple’s notifications servers; examples include a TV-listing app that notifies you before your favorite show is about to start and an alarm-clock app that can wake you up without you having to keep the app running all night. Home screen and app management improvements We wanted a better way to manage apps on the iPhone’s Home screen. We weren’t sure exactly how, but we wanted something more powerful than the current nine-screen, slide-apps-around approach, which just wasn’t designed for a world in which there are 185,000 apps available. What iPhone OS 4 will provide is a way to create app folders: If you drag one app on top of another, the two are combined into a new folder; you can then add additional apps to that folder. Tap a folder, and a new view pops up displaying all the apps in that folder. You can even add folders to the dock, giving you a pop-up app launcher. Apple CEO Steve Jobs pointed out that the new folders feature will allow you to view “over 2000” apps on your iPhone. (The current interface can display only 180 apps—16 on each of 11 screens, plus four in the dock. If you install more than 180, you can access them via the iPhone’s Spotlight search, but you can’t see them all.) We did the math: each folder can hold up to 12 apps, so assuming you can place 16 folders on each of the 11 screens, plus four in the dock, you could theoretically view 2160 apps! Improvements to Mail Between our wishlist article and our overview of Mail on the iPad, we had a laundry list of complaints about Mobile Mail. So we were happy to hear Steve Jobs mention multiple improvements to Mail—and even happier to see him actually demo the biggest one: a unified Inbox listing the incoming mail for all of your accounts. It’s also easier to switch between Inboxes thanks to a new “fast inbox switching” feature that puts your Inboxes in the Accounts list. Other new features Jobs mentioned include the capability to view messages by thread and to open attachments in other apps. But that’s not all: If you happened to be in the audience Thursday, you would have seen the image to the right, which displayed a sampling of the “100 new user features” in iPhone OS 4, a few of which were welcome improvements to Mail: You’ll be able to edit messages in your Outbox, file or delete messages directly in search results, choose larger fonts for reading messages, and choose the size of outgoing image attachments. And that doesn’t include the developer-level features Apple talked about. So clearly there’s more to come. We're looking forward to checking off more of our wishlist in the months ahead.